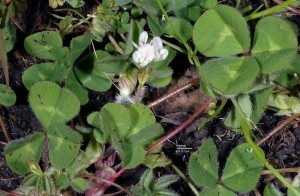 Subterranean clovers are well adapted to grazing. Set stocking is normally advised. As a result of the high protein content of the plant material and the dry pods which are eaten during the summer months, good animal performance is obtained. It is an outstanding rotational crop with cereal and the advantages are the fixing of nitrogen, the reduction of diseases and the controlling of weeds. DM yields of 8 mt/ha are obtainable with a carrying capacity of 4-5 small stock units during winter to 10 small stock units/ha during spring are possible. An average carrying capacity of 3-5 small livestock units/ha throughout the year are possible. Due to the hard seed coating the seed is able to establish itself the following year again.